Audioboom / Unknown photos of the Mufti of Jerusalem walking with Hitlerites in Germany in 1943. Malcolm Hoenlein @Conf_of_Pres. Unknown photos of the Mufti of Jerusalem walking with Hitlerites in Germany in 1943. Malcolm Hoenlein @ConfofPres. "A new catalog published by the Kedem Auction House contains a valuable historical item: six previously unknown photographs from a visit by the mufti of Jerusalem to Nazi Germany. 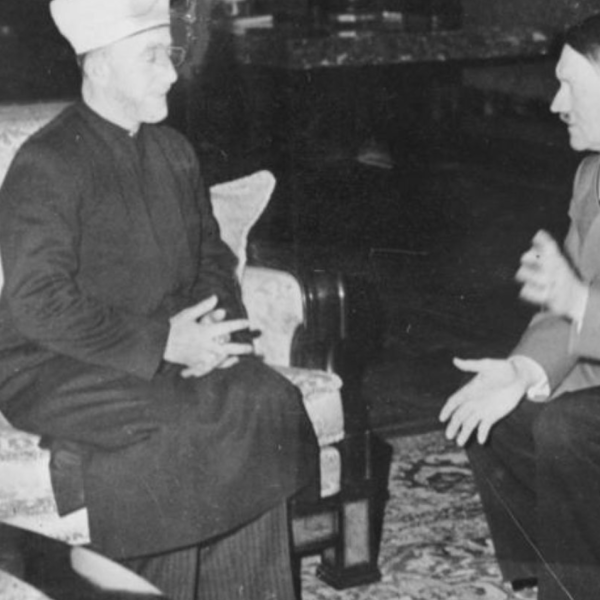 Mufti Haj Amin al-Husseini’s connection to Nazi Germany has made headlines several times in recent years thanks to Prime Minister Benjamin Netanyahu, who used him as an example of Palestinian attitudes toward Israel to bolster his claim that Israel has no Palestinian partner. Granted, Netanyahu exaggerated when he claimed in 2015 that Husseini had persuaded Hitler to launch the Final Solution, but the storm that erupted over that statement did raise awareness of Husseini’s Nazi ties. Two months ago, the National Library of Israel made its own contribution to raising awareness of this story when it published a telegram to Husseini from Heinrich Himmler in which the SS chief wished him success in his battle against “the Jewish invaders.” The six photos that Kedem is now offering for sale show Husseini “during a tour apparently held at a camp” in Nazi Germany circa 1943, the auction house’s website says. The photos, three of which are on the site, show Husseini with several senior Nazi officials in uniform as well as government staffers in civilian dress.,..."